Professional cleaning at a do-it-yourself price is what a new Kranzle home pressure washer means. Our home pressure washer range use either a petrol engine or electric motor with ac pump and concentrating nozzle to boost water pressure from your garden hose as much as 60 times. This lets you blast away mildew, moss, driveway stains, and other grunge a normal hose couldn’t touch – cleaning patios, footpaths, walls and other items more quickly and easily than you could with a scrubbing brush. Our range of mobile, electric powered cold water pressure washers offer high water flow and pressure rates to ensure thorough cleaning results even with stubborn, dirt-encrusted surfaces. Excellent for general cold water cleaning purposes – driveways, patios, paths, vehicles and more. Ranging in pressure from 1000 to 2500 PSI, Kranzle home and medium duty pressure washers are all ruggedly built using only the highest quality components. This ensures everyday reliability and long service life for normal pressure washing use. 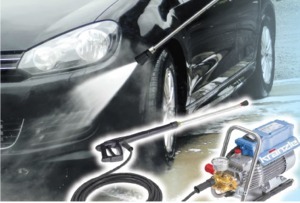 Our electric pressure washers are less expensive to buy but petrol machines have roughly twice the cleaning power, which is the main reason why petrol or diesel powered machines have a clear performance edge over electrics. But more pressure also means more chances for injury or property damage – it’s easy to damage what you’re cleaning with a high powered model. Contact Liam Chawke Electrical & Water Pumps at 069-64318 for more information or visit our shop in Rathkeale and see the full range of home pressure washer options available.